9th Aug. 1936; Jesse Owens won his fourth gold medal as part of the US 4X100 meter relay team having already won the 100 meters, the 200 meters, the long jump at the 1936 Summer Olympic Games in Berlin. This follows his amazing feat one year earlier when he broke three world records in the space of 45 minutes at the Big Ten meet in Ann Arbor, Michigan. American track-and-field athlete, who set a world record in the running broad jump (also called long jump) that stood for 25 years and who won four gold medals at the 1936 Olympic Games in Berlin. His four Olympic victories were a blow to Adolf Hitler's intention to use the Games to demonstrate Aryan superiority. As a student in a Cleveland, Ohio, high school, Owens won three events at the 1933 National Interscholastic Championships in Chicago. In one day, May 25, 1935, while competing for Ohio State University (Columbus) in a Western (later Big Ten) Conference track-and-field meet at the University of Michigan (Ann Arbor), Owens equaled the world record for the 100-yard dash (9.4 sec) and broke the world records for the 220-yard dash (20.3 sec), the 220-yard low hurdles (22.6 sec), and the long jump (8.13 metres - 26.67 feet). Owens's performance at the 1936 Berlin Olympics has become legend, both for his brilliant gold-medal efforts in the 100-metre run (10.3 sec, an Olympic record), the 200-metre run (20.7 sec, a world record), the long jump (8.06 metres [26.4 feet]), and the 4 100-metre relay (39.8 sec) and for events away from the track. One popular tale that arose from Owens's victories was that of the “snub,” the notion that Hitler refused to shake hands with Owens because he was an African American. 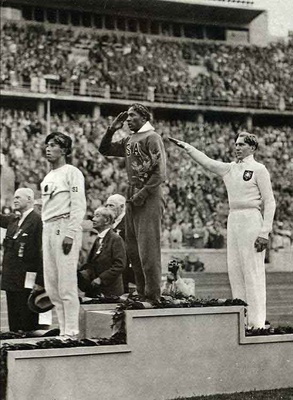 In truth, by the second day of competition, when Owens won the 100-metre final, Hitler had decided to no longer publicly congratulate any of the athletes. The previous day the International Olympic Committee president, angry that Hitler had publicly congratulated only a few German and Finnish winners before leaving the stadium after the German competitors were eliminated from the day's final event, insisted that the German chancellor congratulate all or none of the victors. Unaware of the situation, American papers reported the “snub,” and the myth grew over the years. Despite the politically charged atmosphere of the Berlin Games, Owens was adored by the German public, and it was German long jumper Carl Ludwig (“Luz”) Long who aided Owens through a bad start in the long jump competition. Owens was flustered to learn that what he had thought was a practice jump had been counted as his first attempt. Unsettled, he foot-faulted the second attempt. Before Owens's last jump, Long suggested that the American place a towel in front of the take-off board. Leaping from that point, Owens qualified for the finals, eventually beating Long (later his close friend) for the gold. For a time, Owens held alone or shared the world records for all sprint distances recognized by the International Amateur Athletic Federation (IAAF; later International Association of Athletics Federations). After retiring from competitive track, Owens engaged in boys' guidance activities, made goodwill visits to India and East Asia for the U.S. Department of State, served as secretary of the Illinois State Athletic Commission, and worked in public relations. In 1976 Owens received the Presidential Medal of Freedom, and in 1990 he was posthumously awarded the Congressional Gold Medal.